Our traditional knotted wool prayer ropes are made with 100% wool yarn and come in three different thicknesses, with many style and color options. The knotted satin prayer ropes, natural stone, wooden bead and Panagia’s Pearls are beautiful alternatives that can be worn in any social setting as a reminder to turn our minds to our Lord and to pray the Jesus Prayer without attracting attention. Please note that if a knotted prayer rope is not in stock, it will take about a week to make and ship it. Each prayer rope is crafted with care and prayer by the sisters. The materials used in crafting our prayer ropes are of high quality, but there will always be some variability in the wool or satin cord. The knots are tied closely together, but the prayer rope can be gently stretched so that there is a space in between each knot, and this increases the length of the prayer rope. 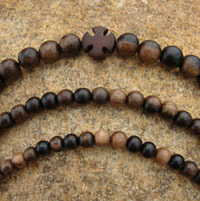 The prayer rope lengths will vary slightly, even when using the same material. 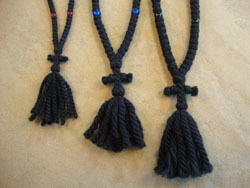 The Russian style prayer ropes are longer than the Greek style, because of the tassel. Satin cord prayer rope lengths are in between 2ply & 3ply. 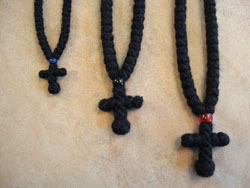 300 knot prayer ropes are made to order. We sometimes have some in stock. Please inquire. Otherwise, please allow 2 weeks for delivery. The beads used in our beaded prayer ropes are individually inspected by the sisters, to insure the highest quality. Some of them are hand crafted (by others) and so there is variety in shape and size. 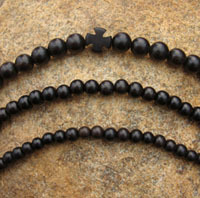 The semi-precious stone and Panagia’s Pearl’s prayer bracelets are strung on clear, stretchable “Power cord.” The wooden prayer bracelets are strung on black, stretch “Power” cord. 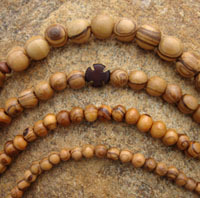 All of the longer wooden beaded prayer ropes are strung on black nylon cord, except for the olive wood, which is strung on 3-ply bonded beading twine. All beaded wrist prayer ropes come with a lifetime re-stringing warranty. If your prayer rope breaks, please save all of the the beads, send them back to us and we will repair it for you. We accept requests for custom prayer ropes. Depending upon the order, there is a 10% additional cost for custom requests and there can be an extra week before delivery to make the prayer rope. We are not able to accept returns or exchanges on custom prayer rope orders.